What is it with me and Koni shocks? Dave brought this up today, every car I've put Koni's on I have had problems. The Z28 I had all sorts of issues with the upper shock mount. The 350Z I was unable to get the Konis off the car when I went to sell the car. 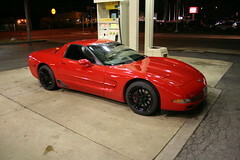 The Z06 things went on alright, though when we put them all I found one of the shocks hard to adjust. I thought I had fixed that and gotten it to adjust fine. Well today in Georgia at the Dixie tour I was unable to get the left front shock to adjust on the car. The trailer is loaded. My bags are packed. Dave and I are headed to Adel Georgia in the morning for the Dixie National Tour this weekend!